Ureteroscopy during pregnancy is contraindicated by most experts, as it exposes the patient to radiation, a risk of ureteral perforation, or a vascular injury in a cramped hypervascularized pelvis. However, a few authors, considering the discomfort of prolonged use of a double-J stent or of a nephrostomy until delivery and the risk of incrustations, have successfully performed ureteroscopies in pregnant women (Rittenberg and Bagley 1988; Shokeir and Mutabagani 1998; Ulvik et al. 1995). The ureteroscopy can be done under locoregion-al anesthesia (Carringer et al. 1996; Rittenberg and Bagley 1988; Scarpa et al. 1996; Shokeir and Mutabagani 1998; Ulvik et al. 1995). Progesterone absorption and dilatation of the urinary track provide problem-free scope advancement without dilating the ureteral mea-tus beforehand (Shokeir and Mutabagani 1998; Ulvik et al. 1995; Watterson et al. 2002), which is further facilitated by continual technical improvements in equipment (such as 7.5-F rigid ureteroscopes and flexible ur-eteroscopes) (Scarpa et al. 1996; Shokeir and Mutabagani 1998). Scope progression can be observed visually, without radiological guidance and with no radiation, provided that a confirmed and experienced endosco-pist does the procedure. Although some experts do not recommend ureteroscopy during the 3rd trimester (Vest and Warden 1990), others consider this procedure possible at any time during the pregnancy (Carringer et al. 1996; Rittenberg and Bagley 1988; Watterson et al. 2002). The calculus is ideally extracted with a Dormia basket (Ulvik et al. 1995). When the calculus must be fragmented, electrohydraulic shock is not advised because it risks inducing labor (Evans and Wollin 2001; Zheng and Denstedt 2000). Ultrasonic lithotriptors present a risk for the fetal auditory system (Ulvik et al. 1995). Using the Holmium laser on uric acid calculi presents the theoretical risk of producing cyanide ions (Teichman et al. 1998a) whose harmful effect has never been proven (Teichman et al. 1998b), probably because the majority of these ions are eliminated by the irrigating fluid (Evans and Wollin 2001; Mauroy et al. 1996). Carringer et al. (1996) consider that laser can be used with no risk in pregnant women. 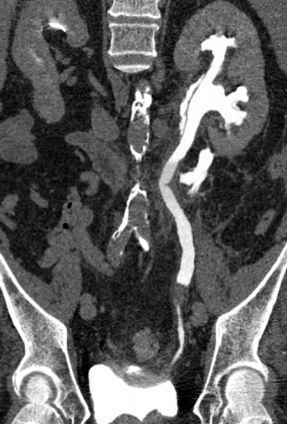 The promotors of the technique refer to a few contraindications to ureteros-copy during pregnancy: inexperienced operator, calculi larger than 1 cm, multiple calculi, transplanted kidney, and sepsis (Biyani and Joyce 2002b).